Disclosure: I received a complementary sample in order to facilitate a review. No other compensation was received. All opinions were honest and my own but may vary from yours. Subscription boxes are all the rage. There are boxes for just about anything from makeup and beauty to ones for children and pets. I recently was sent the Summer VIP box from fabfitfun for review. Fabfitfun is a quarterly subscription service so it's only mailed out once per every 4 months. The cost is $49.99 for each box. Curated by Giuliana Rancic and the fabfitfun team, each box contains premium full-size products worth $120+ of various Beauty, Fitness, Fashion and Wellness finds. Back to School with Gymboree plus $75 Gymboree Gift Card Giveaway Ends 9/5! Disclosure: I received a Gymboree gift card in order to pick out clothing items for review purposes. No other compensation was received. All opinions were honest and my own but may vary from yours. Giveaway is in no way associated with Facebook, Twitter, Google, Pinterest or any other social media site. I was recently sent a Gymboree gift card to do some Back to School shopping for my daughter and share my thoughts and experiences with you. I happened to shop during their huge Back to School sales event, which is still in effect. 30% off all regular priced items and 20% all sale priced items. Plus you can earn Gymbucks! Carole P. Roman Giveaway - $200 Toys R Us Gift Card! Ends 8/25! Christmas is just around the corner! 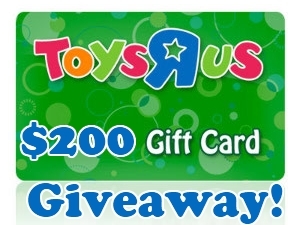 A $200 Toys R Us Gift Card would make for a lot of nice toys this holiday season! :) Enter to win below! YumEarth Fruit Snacks Review & Giveaway Ends 8/21! Disclosure: I received a complementary sample in order to facilitate a review. No other compensation was received. All opinions were honest and my own but may vary from yours. Giveaway is in no way associated with Facebook, Twitter, Google, Pinterest or any other social media site. My daughter loves candy and fruit snacks but I don't like all of the artificial stuff that most of them contain. Sure, most fruit snacks market themselves as full of Vitamin C and all that but most contain high fructose corn syrup, artificial flavors and colors and are generally not an option I like giving my daughter who is already hyper enough as it is. It's also back to school time. My daughter starts back to school in about 2 weeks so I have been making sure I have after school snacks on hand and things ready for the school year. She always is hungry after school but I don't want her loading up on candy or junk foods. 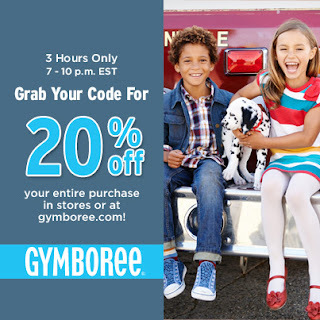 Gymboree FLASH Coupon - Tonight only from 7-10 pm EST! Disclosure: Thanks to Gymboree for providing this special coupon information to certain bloggers. No product or compensation was received for posting. Do you love Gymboree and their cute children's clothing? Love to save money? Then guess what? There will be an EXCLUSIVE coupon available tonight for 20% your entire purchase! Between 7 and 10pm EST ONLY, you will visit a special link, grab your coupon to use in store or online. Then you will have through Thursday, August 8, 2013 to use it. What makes it exclusive? It's not exclusive to just my blog but Gymboree will NOT be advertising this offer/coupon through their emails or via their website. Come back later tonight at 7pm for the exclusive link and save 20% this week. They are having an already amazing sale for Back to School. 30% off regular priced styles and 20% off sale items, PLUS you can earn Gymbucks AND you can use the 20% coupon for MORE savings!